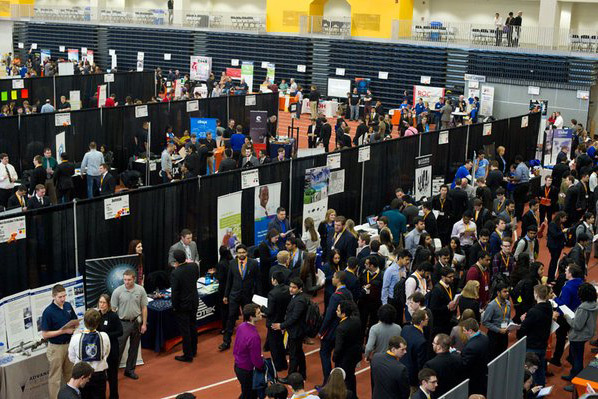 Thousands of RIT students attended a recent career fair. More than 265 employing organizations and nearly 950 recruiter representatives seeking Rochester Institute of Technology students and graduates are attending the 2018 Fall University-Wide Career Fair 10 a.m. to 4 p.m. Wednesday, Oct. 3, in the Gordon Field House. It will be the largest career fair RIT has hosted in its 17 years of hosting career fairs. The fair is open to current RIT students and alumni; more than 5,000 are expected. The event allows them to meet with prospective employers to explore career opportunities for internship, cooperative education and entry- or experienced-level positions. RIT’s cooperative education model is one of the oldest and largest in the country. More than half of the students participating in co-op will go to work for one of their co-op employers upon graduation, said Maria Richart, director of RIT’s Office of Career Services and Cooperative Education. There are employers attending from 30 states, including many from the West Coast. Among the companies attending are Bank of America, Microsoft, Cisco, BAE Systems, Datto, BorgWarner, EY, Magna, Northrop Grumman, Oracle, UTC and Wegmans. About 15 percent of the companies are organizations that have never recruited at RIT previously. Employers from every region in the country will be attending, including nearly 60 employers located or with operations in the Rochester area. Representatives from more than 115 of the companies will remain in town to interview students Thursday following the career fair. Many of the attending employers will send RIT alumni to represent them and engage with faculty and student clubs and organizations while on campus. Richart said the turnout is a clear reflection of the continued strong demand for the outstanding student talent RIT produces. Recruiters and students will also be able to network in the afternoon. A Saunders College of Business networking event will be at the Gordon Field House, mezzanine level, from 2 to 4 p.m.; The Affinity Reception for employers and special interest student groups including the American Indian Science and Engineering Society, The National Society of Black Engineers, Saunders Multicultural Business Association, Society of Hispanic Professional Engineers, Women in Engineering, Women in Technology, Women in Computing, the Neurodiverse Hiring Initiative and more, will be held from 4:30 to 6:30 p.m. in the Field House; and the RIT Performance Team Open House, with RIT’s Formula SAE, Baja SAE, HotWheelz Formula SAE Hybrid, Clean Snowmobile, Aero Design and Electric Vehicle teams, will be held from 7 to 9 p.m. on the second floor of the Kate Gleason College of Engineering. Students are encouraged to plan their visits in advance. A list of the participating firms is available online at http://www.rit.edu/emcs/oce/student-home.